Boaters who typically head down along the western shore of the Chesapeake Bay or end their Intracoastal Waterway trip in North Carolina are missing out on charming harbor downs and two pristine coastlines on Virginia’s Eastern Shore. 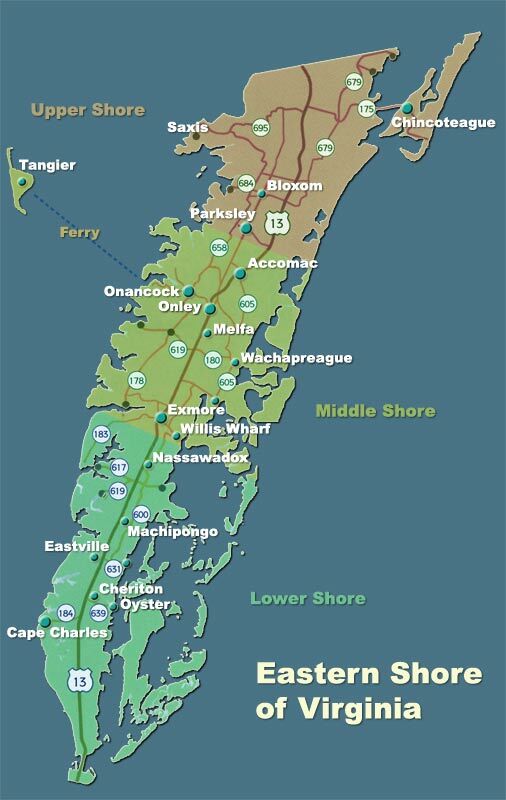 Harbor towns like Cape Charles, Onancock, Saxis, Chincoteague and Wachapreague on the 70-mile Virginia Chesapeake Bay coastline, have growing numbers of restaurants, shops and hotels just steps from the town harbors. Virginia’s Eastern Shore is only three hours by car from Washington D.C., but it’s a world apart. Settled in the early 1600’s, the region was isolated from mainland America for four hundred years, until the convenience of rail, then cars, made it a bit more accessible. The Chesapeake Bay Bridge-Tunnel connected the southern tip to mainland Virginia in the mid-60s. Things have changed slowly on the Eastern Shore of Virginia over the centuries. Today the culture is a rich mix of families with roots that are hundreds of years old and an influx of escapees from the big cities to the north. In some ways, modern America has barely touched down on Virginia’s Eastern Shore. Most of the hotels, B&Bs, restaurants and shops are locally owned. Cell phone connectivity can be spotty, and nobody is in much of a hurry. In other ways, the future of America is here — NASA has been launching missiles at Wallops Island since 1945, and watermen are using cutting-edge science in their aquafarming outfits. Catch a glimpse of Onancock Creek while dining al fresco at Bizzotto’s Gallery Caffe. Just southeast of Tangier Island, Onancock is approached along the five-mile Onancock Creek lined with majestic homes. Once you dock, stop in at the harbor office and pick up information about the town, including a walking tour guide. Go no further than a few steps to Mallards on the Wharf for a meal overlooking the water or walk up the hill to the town center and you’re at one of the Virginia Eastern Shore’s culinary crossroads. Choose from an upscale bistro, an Italian kitchen, an Irish pub, a casual cafe open for breakfast and lunch, and two dinner-only boutique inns: The Inn and Garden Cafe and the Charlotte Inn and Restaurant. In the morning, stop in at the Corner Bakery for their signature donuts. Once you get to Onancock there are plenty of ways ot have fun on the water. Hunt for treasure at boutiques, art galleries and antique stores and pick up some treats at the North Street Market. Enjoy a short walk to Ker Place, an elegant Federal-period estate, and the Eastern Shore of Virginia Watermen’s Museum and Research Center. Both tell the story of America from its earliest days. If you’re in the mood for a night on land, B&Bs are tucked away down neighborhood streets. You can catch the latest movie at the quaint 1950s Roseland Theater; it has a state-of-the-art digital sound system. Or take in a live show at the North Street Playhouse. Pull out your walking tour guide and head across the bridge nearest the harbor to Mount Prospect, a neighborhood overlooking Onancock Creek and enjoy the quiet, tree-lined streets anchored by the circa 1790 Prospect Hill estate. Life in Onancock centers around the water. Explore Onancock Creek with the Burnham Guides, either on a guided paddler or in a kayak rented from their shop. If you’d like someone else to take the helm, take a laid back two-hour cruise with Onancock Sailing Adventures and learn more about the area. If you haven’t been to Tangier Island yet, catch the Tangier ferry May to October right at the Onancock harbor. Near the southern tip of Virginia’s Eastern Shore on the Chesapeake Bay, Cape Charles is a relaxed, cheerful beach town with a free beach that’s steps from the town harbor and bustling town center. Breakfast or lunch at the Cape Charles Coffee House and shop along the main street, Mason Avenue, which is lined with shops and galleries. Don’t miss Watson’s Hardware — it’s well stocked with everything from tools to beach toys. The schooner Virginia moored at the Cape Charles Yacht Center during Experimental Film Virginia. The boutique Hotel Cape Charles looks out over the harbor, and stately Victorian B&Bs line the neighborhood streets nearby. Opposite the town harbor, you’ll find the Cape Charles Yacht Center, which can accommodate megayachts and offers storage and servicing, which offers ground transportation for boaters. Walk the trails at the Eastern Shore of Virginia Wildlife Refuge, a short drive from Cape Charles. An art deco theater spotlights local, regional, and national talent. The Oyster Farm at Kings Creek, with a marina, restaurant and event venue, flanks the northern side of town, and Bay Creek Resort & Club on the southern side is home to two nationally ranked golf courses designed by golf legends Jack Nicklaus and Arnold Palmer. The Saxis Island Museum is just a short walk from the town’s harbor. Saxis sits on the Chesapeake Bay, just south of the Maryland border. It is an island in name alone. It is connected to the rest of the Eastern Shore by a large marsh that also serves as a wildlife refuge. The town’s shallow harbor is only navigable by smaller boats, but it’s well worth a stop. Dine at one of the two restaurants in town. If you’re coming off the water early grab breakfast and conversation with locals at Martha’s Kitchen. If you need a little local seafood and a cocktail to unwind after a hard day of seafaring wiggle your toes in the sand at the tiki bar at Captain E’s Hurricane Grill. After you grab a bite to eat, stroll the small town streets and wander into the Saxis Island Museum to learn more about the town’s 350-year history. If you find the museum locked, call the number on the door. The staff are all just minutes away and would be happy to show you around. Take a walk along the town’s sandy beach or \swim in the shallow, warm waters of the Chesapeake Bay. It’s known as a great spot for finding sea glass. If you’d like to spend a night on land Tall Pines Harbor Campground a few miles up the road offers everything from primitive camping to cozy cabins. In true small-town fashion, to rent a slip in Saxis contact Mayor Denise Drewer at 757-710-4747. Wachapreague is the gateway to the barrier islands off the coast of Virginia’s Eastern Shore. You can boat right up to the islands, hop out and spend a day on the sand, just be sure to leave nothing but footprints behind and obey all posted signs. Once you get to Wacahpreague there are plenty of places to tie up, including a town marina and several privately owned facilities. All are within easy walking distance of Wachapreague’s attractions. After a day on the barrier islands head into Wachapreague for dinner at the Island House. Enjoy fresh local seafood while looking out over the salt marsh and the islands you just left. Spend the night at a vacation rental, Airbnb, campground or motel. Then rise early for a breakfast sandwich at Trident Tackle or the Wachapreague General Store. After you’ve filled up spend a day fishing, birdwatching or kayaking with an eco-tour guide. Chincoteague Island is the perfect blend of small-town charm and modern conveniences. Old school seafood joints coexist with food trucks and family classics like mini golf and bumper boats can be found alongside a craft brewery. Chincoteague has numerous facilities where you can tie up, whether you want to be right in the middle of town or enjoy the luxury of a hotel and marina with views of Assateague Island. Harbors and marinas on Main Street offer easy access to restaurants, shops and entertainment, while facilities on the Atlantic side of the island offer easy access to Assateague Island and the famous Chincoteague ponies. Hop on the Pony Express, the town’s trolley service, and take a ride to the Museum of Chincoteague Island. Learn about the island’s history from ancient past to modern day and get a look at Misty, the pony made famous in the children’s classic Misty of Chincoteague. After your tour of the museum, rent a bike and pedal into the Chincoteague National Wildlife Refuge for a look at the wild ponies and a day on the beach. If shopping is more your style, browse the shops on Main Street or stop by the farmer’s market, it’s open twice a week in the peak of summer. When you start to get hungry, try the local Chincoteague oysters. They’re briny and crisp. And no trip to the island would be complete without a scoop of ice cream from the Island Creamery, it’s been voted the best in American so many times it’s easy to lose track. For boating safety information click here. Beautiful pictures make you want to go! Enjoy your trip!